We are mothers of Saint Anne's Parish. Together with our children, we seek to grow spiritually, create friendships, provide support and connect with the community through faith, fellowship, family, recreation and service. 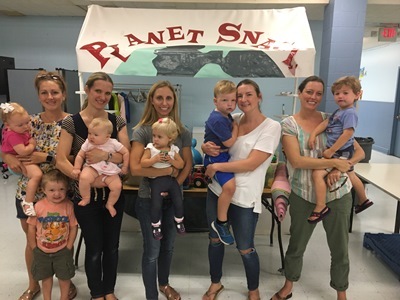 The Saint Anne's MOMs group welcome women from Saint Anne's Parish who are mothers of young children, offering them many ways to connect with one another and to find support with the challenges inherent in motherhood. The group began when a young mother approached the parish, looking for a way to meet other moms and find opportunities to grow together in our faith community. Many moms have developed wonderful friendships for themselves and their children through this ministry. No one can argue with the fact that moms are giving people. They are constantly bringing, doing, sharing and providing. But many mothers, despite their hectic lives and busy schedules, still want to be part of the charitable community of Saint Anne's. Through the MOMs Ministry programs, mothers are invited to become involved in service activities or to participate in discussions on spirituality or simply to pray together. Moms can choose to be involved as much or as little as their schedules allow. The Faith and Friendship committee addresses the need for MOMs to enhance their relationship with God and to experience this journey with friends. The committee hosts panel discussions on faith topics and hosts a monthly Church Discovery program for children to explore their church. MOMs in Service helps coordinate the effort of MOMs members to participate in parish ministries such as working with Loaves and Fishes to provide food and gifts to needy families around the holidays. In the fall, MOMs sell mums at Spirit Day to support the parish as well. The Sunshine Club helps support fellow MOMs who are experiencing a difficult time in their lives. Meals for MOMs is a committee that sends baby announcements out to members and coordinates meals for mothers who have recently given birth to new babies. St. Anne's MOMs provides various ways for MOMs from Saint Anne's Parish to gather together socially, both with and without their little ones. Many associate the MOMs group with the weekly playgroup known as Coffee and Kids. Here in the Saint Anne's School cafeteria each Wednesday morning bagels and coffee are served, children can play freely, a craft table is often set up for creative projects and a guitarist plays children's songs during 'circle time.' All of these activities offer moms with small children the opportunity to talk, share ideas and challenges, and forge new friendships. But as great as it is, Coffee and Kids is only one part of what the MOMs group is all about. Outside of Coffee and Kids, the MOMs keep busy. Family events, Couples Night Out, or mom-only outings such as Socials, Dinner Clubs or MOMs Night Out are great ways to let off some steam and recharge batteries. There are so many opportunities for mothers to connect socially that there really is something to suit everyone. Mothers of Saint Anne's Parish who are interested in joining the Saint Anne's MOMs can join as full members (membership with Coffee and Kids) or as social members (membership excluding Coffee and Kids). If you would like to join, please email our membership chair, at stannesmoms@gmail.com or you may call the parish office at 352-5904 for more information and to register if you are new to the parish.